Odors in a home can cause headaches, nasal irritation, dizziness, and nausea. Unpleasant odors are created by a lack of proper ventilation and poor air quality. The EZ Breathe® healthy home ventilation unit expels dirty air, removing unwanted smells. 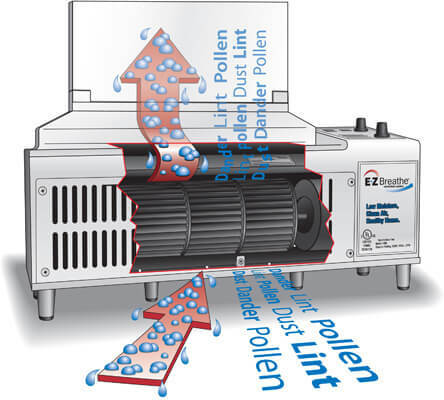 The E•Z Breathe® Ventilation System is a maintenance-free unit (can you say no air filter changes?) that helps protect your home and family from excess moisture, molds, toxins, allergies and poor air quality resulting in a cleaner, healthier living environment. It provides powerful ventilation, supporting the EPA’s recommendations to use a ventilated system to reduce indoor air pollution. E•Z Breathe Ventilation System is discreetly installed in any basement, crawlspace or even garage and vented outside the home. It allows fresher, cleaner air to circulate into the space creating much needed air exchanges in what is scientifically proven to be the most polluted air quality of the home. EZ Breathe is owned by a 2nd generation family business that has been working in homes with basements and crawl spaces for over 35 years. They’ve been water proofing and sealing about 500 foundations a month during that time as the largest waterproofing contractor in the Midwest with 15 locations servicing 8 states. Their passion and commitment to helping people improve their indoor air environments is evident. They spent the last 15 years dedicated to learning about the relationship between our home and our health; indoor air quality, the home as a system, building science and how it relates to indoor air quality as well as the challenges our modern day practices pose to the quality of air we breathe in our homes. EZ Breath believes that homeowners everywhere deserve a healthy indoor air quality…and so do we! The home and it’s family were living healthier lives! Makes people healthy and happy! Ready to Win and EZ Breathe? 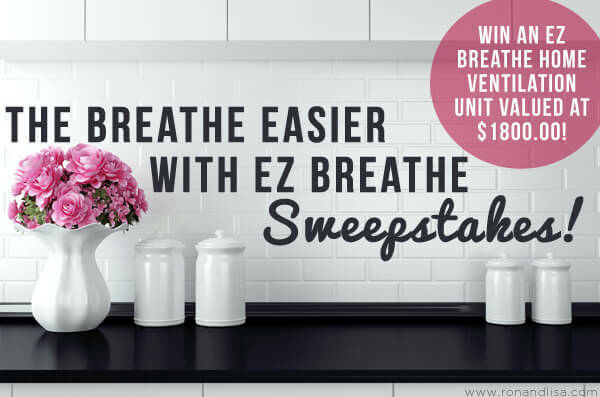 One [insanely] lucky RonandLisa.com reader will win an EZ Breathe Healthy Home Ventilation Unit valued at $1,800.00! Who’s ready to enjoy a healthier, cleaner, and safer air for themselves and/or their family? Will you be the grand prize winner? Enter daily for a chance to WIN and please share this page with a friend, loved one – or anyone – that could benefit from reducing mold, mildew, allergens, toxins and chemicals in their home. For every action below that you complete, you receive a specific number of entries. Click each individual action to enter yourself. For actions you have done in the past (i.e. you are already a fan of EZ Breathe System on Facebook) just click directly on ‘I did this’. The eligibility of the winner will be verified by The Healthy Home Dream Team®. There is no mandatory entry. Each action will earn different numbers of entries into the contest. You may Tweet or share on Facebook or Google+ for an entry once per day. All other actions will only be counted once. Sweepstakes open to US and Canadian residents age 18 and over. Contest ends 7/28/16 at 12:15am PST.